Only twice have I been in the same room as death. The first time was when my grandfather died, peacefully in a hospital bed. The second time was when a drug addict died of an overdose at a cinema where I was working. There was nothing peaceful about that, or the failed effort to bring him back to life. On film on the other hand death is a constant presence, and many have perhaps only experienced death through seeing it in moving images (in the news or in fiction). It is a peculiar thing. Does it teach us anything? Does it make us more prepared for when we too will encounter it? For children, experiencing death on film might be very traumatic and perhaps therapeutic. I worked as a projectionist when The Lion King came out and I used to go into the screening room at the moment when Simba's dad is killed. I did it because it was so moving listening to the children. There were two kinds, those who had seen it before and started whispering about how the dad would die soon, and those who had not seen it before and were very concerned. The tension in the room was palpable, 100 kids shifting in their seats, holding their breaths. "We live - as we dream - alone." wrote Joseph Conrad, and we die alone too he might have added. We might reach out for a hand to hold in our last moment, as in the very end of Heat, but that is not the same. Or we might be embalmed in a light from above, as in so many death scenes in the films of Ingmar Bergman. A peaceful and benevolent light, but one which also emphasis the loneliness of the deceased, the only body in the light. But Carol in Wyler's Mrs. Miniver had neither a hand nor a light to sooth her, instead she died by herself on a cold wooden floor. Death was of course of special significance for Bergman, who made several films about it, and even had Death appear in person. The first of his films with an embodied figure of Death was Summer Interlude (1951) and it was not the last. Death is usually seen as something tragic, but it does not have to be. In several of Bergman's films death is a relief, a victory even. When the pain is too strong, when life brings nothing but misery, dying is not necessarily a bad option. The saying "Every day above ground is a good day." (which I have seen motivational speakers sometimes use) seems to me to be putting the bar terribly low. And only because somebody has died does not mean that they are necessarily gone. 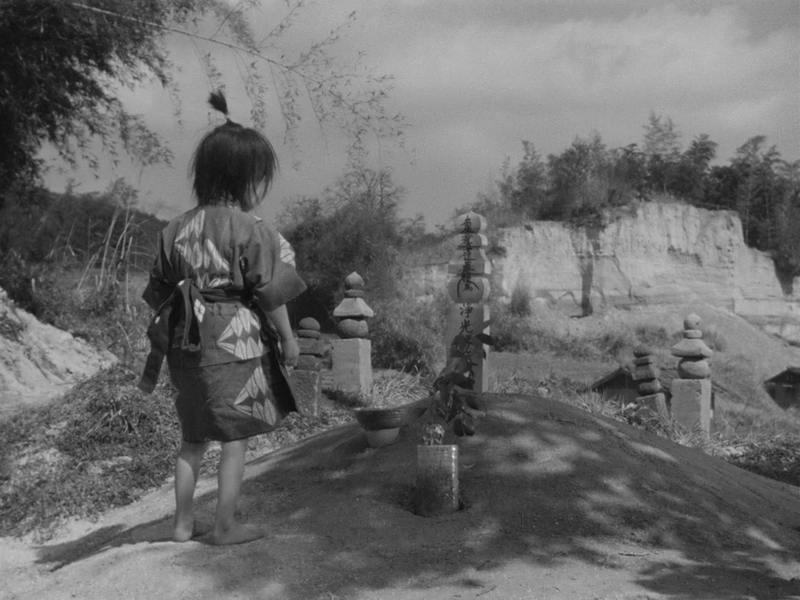 Ugetsu Monogatari suggests different ways in which the dead might remain. As ghosts, or hallucinations, or voices. It is not easy to know how one will react, or should react, when somebody dies. It is easy for others to judge those that show no outward signs of grief and sadness, but that is very unfair. Everybody reacts differently, and nobody else can know what goes on inside another person. They might not even know themselves. Little Eddie, in The Courtship of Eddie's Father, is concerned about not feeling enough about his mother being dead, he is afraid he will forget about her. Then one day he finds his goldfish dead in its bowl, and then he reacts. He reacts with a combination of shock and fierce grief that is unbearable, and one of the most moving death scenes in all of cinema. Sometimes death is sudden, swift and merciful. In Superman Jonathan Kent is walking on his farm when suddenly he has a heart attack. "Oh no." he says, and then he dies. Sometimes it is the opposite. In Black Hawk Down one of the rangers is slowly bleeding to death while his comrades are desperately trying to save him, in a scene which is long, messy and incredibly intense. I hardly ever cry when watching films but that scene has an unusual effect on me. It is not just that he dies, but how. The terror, fear and panic, together with the visceral close-ups of blood, tissue and bone, makes the sequence overwhelming. That is not how you want to die. To die with dignity can be of great importance to some, or to be left alone. When Judd dies in Ride the High Country he asks that the others stay away. "I don't want them to see me like this." he says. When he is alone he looks at the mountains, the last thing he sees is where he used to live. He died the way he had too, and even though he might have wanted to live on there was no place for him any longer and at least he died in a noble way. Ride the High Country was directed by Sam Peckinpah, for whom death was as important a subject as for Bergman. A particularly fine scene is this, from Pat Garrett and Billy the Kid, where an older couple, played by Slim Pickens and Katy Jurado, is helping a friend take care of some outlaws, with sad consequences. Bob Dylan wrote the music for that film, and Colin Baker sits by the river, knocking on heaven's door. What happens next is unknown. But films provide many suggestions. In the wonderful After Life you end up in a transit area after you die and there you are asked to think of your favourite memory. When you have decided upon one, that memory will be recreated and you will be living it for the rest of eternity. All memories are different, it is a very personal thing, and for all the sweetness and wisdom in the film it is still the case that in the end we are alone. What of the rest of us, those who have not died? The best we can do is grant our dying friend a last request, and then go into the other room and cry, as in Only Angels Have Wings, another great film on the subject of death. But we must not stay in tears for too long. A message of the film, a very Hawksian message, is that the dead do not matter, it is us the living that matters. We who are left alive best honour the dead by go on living, continuing with our lives. I have not forgotten Powell and Pressburger's A Matter of Life and Death (1946), but I will write about it in full later this year. The world after life in A Matter of Life and Death. 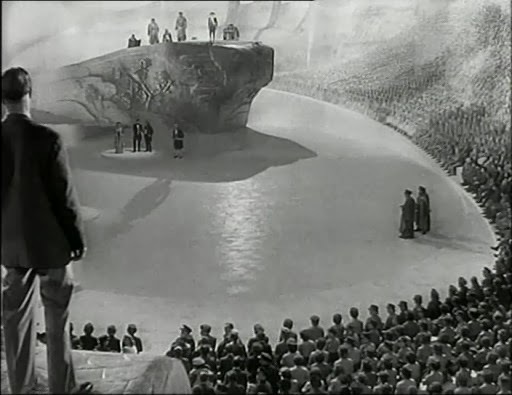 It is not unusual that, when Citizen Kane (Orson Welles 1941) is written about, The Power and the Glory (William K. Howard 1933) is mentioned as a possible inspiration. The earlier film is not widely seen but it is worth seeking out both because it is similar to Citizen Kane and because it is a good film in its own right. It is also Preston Sturges's first original screenplay and one of the first times Spencer Tracy plays a leading role, even though he is not as extraordinary good as he would later become, so it is a historically significant film. It is about a man, Tom Garner, who works himself up from humble beginnings to become a powerful and wealthy man (he is in the railway business) but who alienate his family and dies alone. At the moment of his death he utters one single word. The film begins with the death and is then told in non-chronological flashbacks that take place on three planes, the rise from childhood, the fall, and the present day, and is quite intricate. So the connections with Citizen Kane are rather obvious. Welles though said (in This is Orson Welles) that he had not seen The Power and the Glory and since he was in general not shy of highlighting his inspirations he was probably telling the truth. But it is of course possible that Herman J. Mankiewicz, the co-writer on Citizen Kane, had seen it. The script was so advanced that a new word was coined in order to explain it, "narratage", a term that did not really catch on. It refers to the use of a complex flashback structure that is authored by a voice-over to help give a sense of order and continuity. The Power and the Glory was not the first film with a flashback structure, that was common enough, but it was pushing the concept further. The person who tells the story is Tom's friend Henry, one of the few who actually liked Tom. But how does Henry know all these things? In one scene Tom asks Henry "Do you know?" Henry answers "No." and Tom replies "It's a secret." Yet Henry has told us about it, or rather, he is in fact telling us about it, so he does seem to know. Is he even to be trusted? There are many in the film who are deceitful after all. The most remarkable deception is when Tom's second wife becomes pregnant and it turns out that it is not Tom but Tom's son from his first marriage who is the father. 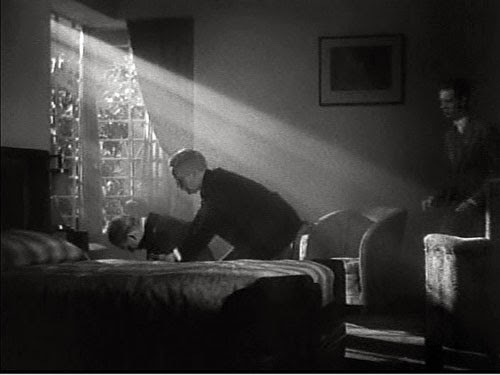 The cinematographer of The Power and the Glory is James Wong Howe and there are some striking deep focus shots (such as when Sally Garner decides to kill herself), and there is a fine visual connection between the beginning and the end, with lights beaming through the windows in the opening sequence (the funeral) and the scene at the end when Tom dies. Howe and the director William K. Howard did several films together and who was primarily responsible for the look of them is hard to say. 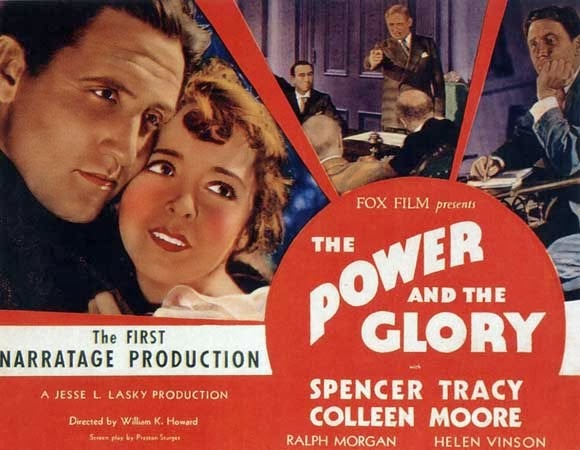 The theme of The Power and the Glory is similar to Citizen Kane, and many other stories as well. It is perhaps one of the oldest of tales, how greed and ambition can ruin a person. On his deathbed Tom utters one word. The word is "Sally", his first wife and one true love. He lost her, and everything else that mattered. Here is an earlier post about Sturges. When Sturges directed his first film, The Great McGinty (1940), which he had also written, he was again telling the story of the rise and fall of a man through flashbacks. It is less complex and more light at heart, but a very good film. 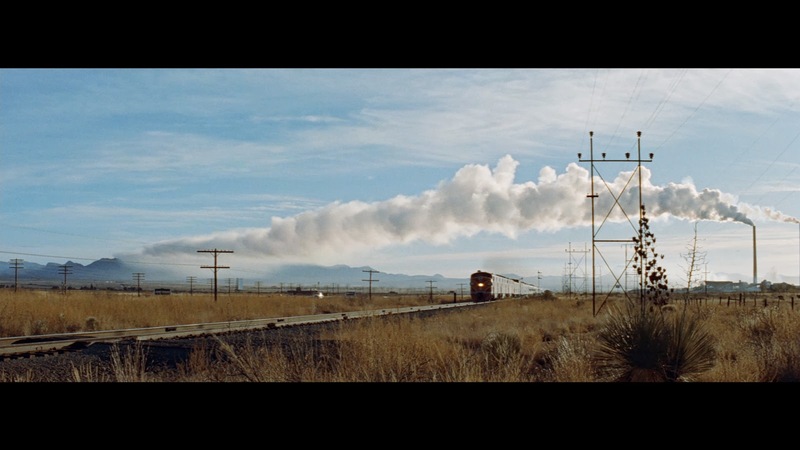 To complement an earlier post about trains (and to mentioned Richard Fleischer again), here is a fantastic shot from Violent Saturday (Fleischer 1955). It is almost like an optical illusion, with the smoke not coming from the train yet looking like it does. The low angle of the camera captures the immense sky and the plains and hills and the pylons also help to make the image come alive, without being cluttered. Just for good measure, here are two paintings from two key European artists that also signals the allure that trains have on the imagination of artists. The first is J.M.W. Turner's Rain, Steam and Speed from 1844. 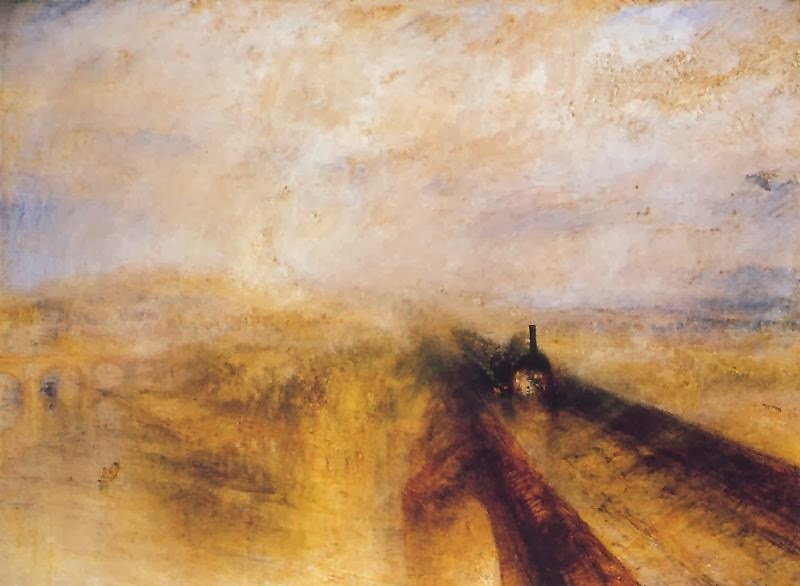 One critic said that Turner had managed to paint "speed itself". You may not see it on this small image but there is a hare in front of the train, desperately trying to escape from it, a detail that gives added meaning and depth to the painting. 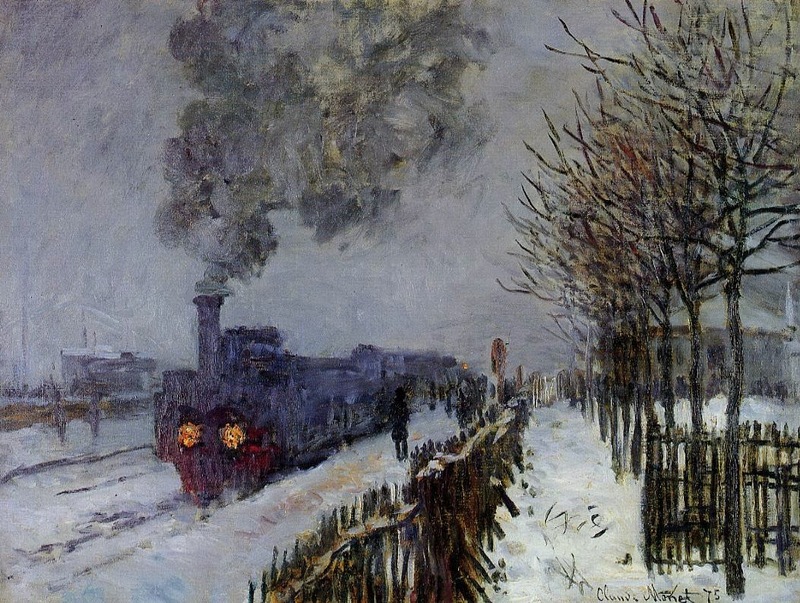 The second example is by Claude Monet, who made a number of paintings with trains (as did other Impressionists as well, such as Camille Pissarro). This one is called Train in the Snow (or The Locomotive), from 1875, and is much less explosive than Turner's. There is no speed here but a moment of rest, which is more in line with Monet's sensibilities. It seems cold, only the headlights generate any heat or colour, but instead of feeling in any way threatening this train seems to be kind and inviting. If you want to see the real paintings Turner's is to be found at the National Gallery in London (even there the hare is difficult to spot) and Monet's is at Musée Marmottan in Paris. I began blogging in 2005, in Swedish under the name Filmforum. I kept that blog going until the middle of 2009 when I moved to Scotland. That is when I began this blog, Fredrik on film, because I felt that I should write in English instead. So Filmforum retired, after 260 posts, and the new blog took over. Today it celebrates its 250th post! I think that is cause for some celebration. The first post I published was about Meet Me in St Louis (1944) and Vincente Minnelli. It was a short piece, a simple celebration of a favourite film (and filmmaker), and not one for posterity perhaps. Actually a lot of my posts in the first year or so were short and sometimes written more for the sake of writing than because I necessarily had anything I wanted to say. But right from the start you can still see what my priorities have been. Swedish cinema, including Bergman, lesser known filmmakers, common myths and preconceptions about film history, and philosophical discussions about film and our engagement with films and film history. It is very satisfying to be able to write freely, without any interference, about the things that matter to you. I intend to continue writing on the blog, at least for as long as I feel I have something to say and there are people out there that want to read about that something. I am very happy for the readers I have got, and to all those who have visited me so far I am very grateful. I hope I will be able to keep my present readers and perhaps even entice some new ones, and to develop this blog even more. We shall see what happens next! A few words about Tokyo Story (1953). A selection of Swedish films. Some thoughts on Gilles Deleuze. Max Weber goes to the movies. 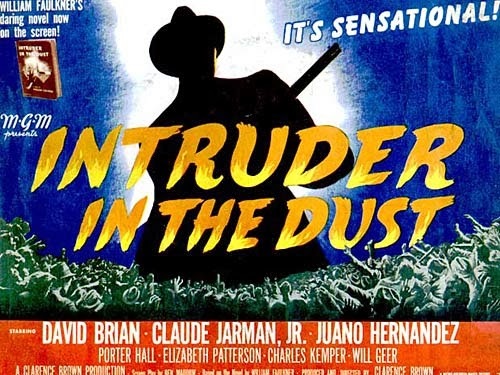 About racism and Intruder in the Dust (Clarence Brown 1949). About Letter from an Unknown Woman (Max Ophuls 1948). About game theory and The Maltese Falcon (John Huston 1941). About the history of auteurs. My second post in the series "Reading Bazin", this one about direct address and time. About the problems with comparing all films to Hollywood. I have a Ph.D. in film history from the University of St Andrews. The thesis was about Swedish cinema in the 1940s, with a focus on the great but largely unknown Swedish filmmaker Hasse Ekman. I also have an M.A. in the History of Ideas. My book about Hasse Ekman, The Man from the Third Row, was published by Berghahn in October, 2016. I teach film history at a university outside Stockholm and I also work at the library at the Swedish Film Institute. Previously I have been working at the Ingmar Bergman Archives, among other things going through all of Bergman's personal correspondence. I have also been working as Ingmar Bergman coordinator at the Swedish Institute, organizing Bergman festivals all over the world. I write regularly for different film journals, such as Filmrutan and La Furia Umana (where I am on the editorial board). I have contributed to some edited collections and I have also written articles and reviews for Frames Cinema Journal, which I was the founding editor off.